(UPDATE MAY 20, 2006 - no reply from government agencies after a month: letter of complaint sent to federal ministers. 2.What are the health risks? 3.What should be done about the poor health of Canadian seals? Admit seals are not fish, but mammals, and can transmit significant infectious diseases to people. Stop eating seals and using their tissues for any purpose, including furs. 4. What are the veterinarians saying? 5. What about the idiotfish*? Canadian products from seals that are being sold commercially may be unfit for human use or consumption because seals are not bound by the “healthy at the time of slaughter” rule, nor are they processed in accordance with the Canada’s “Meat Hygiene Directives,” both practices that are enforced in the legal trade of all other mammals. This exemption is based on seals having been classified as “fish” under certain parts of Canadian law, which creates a legal loophole that is currently being exploited by ill-advised “seafood” processors selling seals. The upshot is that human consumers of seal products, both within Canada and internationally, are potentially exposed to serious health risks that are transmissible to humans from animals. Therefore, Canadian produced seal oil, seal meat and seal pelts may all be unwholesome by accepted international standards. “Veterinary Health Certificates” are required to accompany all exports of “animal products.” This ensures that not even a cowhide destined to be processed as boot leather in the most remote corner of the Earth can be exported from Canada without a veterinarian attesting to the health of the cow, as determined by inspection both before and after its death. Veterinarians systematically screen cows and other livestock for a host of contagious diseases that might be passed on to humans or other animals, and the movement and trade of animals and animal products is restricted accordingly. This activity is regulated under Canada’s Meat Inspection Act. 2. What human health risks may be posed by Canadian seal products? Evidence of Brucellosis has been found in Canada in harp seals, grey seals, hooded seals, walrus, polar bears and whales. Brucellosis in humans is transmitted from animals (i.e. people don't catch it from other people. "Zoonotic" refers to infectious diseases in animals that can also infect people, and that can make people sick). Slaughterhouse workers, farmers and veterinarians can catch brucellosis from contact with infected animals. The bacteria can enter through skin abrasions, mucous membranes or the lungs. Consumers of un-pasteurized dairy products, or occasionally of raw meat from infected animals, can also catch brucellosis. Symptoms of this infection may be insidious and chronic and include fatigue, fever, headache, abdominal pain, weight loss, swollen lymph nodes and arthritis. In chronic brucellosis, which can linger for years, fever may come and go and psychoneurosis may develop in addition to the other symptoms. If medical doctors do not suspect a diagnosis of brucellosis, this disease can be confused with various others, including tuberculosis, Hodgkin's disease and malaria. Brucellosis (infection with various strains of a bacteria called Brucella) is a highly contagious disease of mammals, that threatens animal and human health. In livestock (cows, pigs, sheep, goats) a high rate of abortion is a prominent consequence of Brucellosis. If Brucella is found in animals being raised for human consumption, strict control measures must be implemented to eradicate this dangerous germ. This means an end to movement and trade of infected and exposed animals, along with various other measures and precautions, including notification of international authorities that Brucella has been found in food animals. Why has Canada not reported to the OIE that practically every species of marine mammal in its waters has tested positive for Brucella antibodies in recent years? Incredibly, it seems that the fishy-seal loophole has been exploited all the way to the OIE, because the OIE divides reporting requirements into lists of diseases affecting “terrestrial animals” and diseases affecting “aquatic animals.” A reporting loophole exists because marine mammals do not appear under either of these categories. This may be because, at the time when the disease lists were drawn up by the OIE, there was no international trade in any marine mammals for human consumption, nor was any anticipated. The problem is that, in Korea, this information might be misinterpreted to mean that Canadian seals have been tested (as "meat") and found to be free of potentially serious diseases that might affect seals, such as brucellosis. However, if infectious agents are not detected and then slip through the "seafood processors'" methods, unsuspecting Korean consumers might become ill.
Just because the OIE does not list diseases in seals, does not mean that there are no significant diseases in seals. It would be “prudent” at this time for Canada to implement the usual animal health restrictions that are enforced whenever brucellosis is found in Canadian market-bound domestic livestock, don’t you think? If this step is taken, and ethical notification of the situation is sent to the OIE, it is apt to bring to a quick end all Canadian commercial export trade in seal oil, seal meat, and seal pelts. Brucellosis is a dangerous disease...yet, incredibly, Canada has had nothing to say about brucellosis in seals, but has advised people to consume seal oil for the "health" benefits. Grey seals in Nova Scotia may already be getting into serious trouble with brucellosis, because the latest pup count showed an unexpected shortage of pups at Sable Island, where this herd is centered, and where seals were found to have a high positive test rate for Brucella antibodies. Based on previous observations of the rate at which the size of this grey seal herd was increasing, DFO scientists would predictably have found about 60,000 pups on the island when they conducted their latest aerial survey in 2004. However, they found 41,000 pups instead, almost 20,000 less than expected. 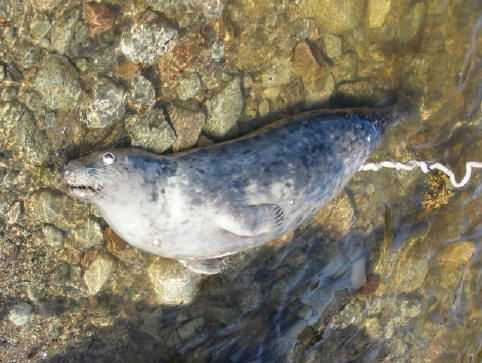 It must be considered that the Nova Scotia grey seal herd might now be experiencing failed reproductive success because of infection with brucellosis. Are grey seal fetuses being aborted at an unusually high rate in Nova Scotia, and are these abortions being caused by brucellosis infection? This is a very difficult question to answer for a wide-ranging population of wild animals that may drop their aborted fetuses into the sea. Testing the fetus and the placenta is necessary to say with certainty that an abortion was caused by brucellosis. In September, 2004, I discovered an aborted grey seal fetus at the shore near my home. Since I was unaware at the time that the Nova Scotia grey seal herd carried brucellosis (because the authorities have not told the public) I regrettably did not think to report this finding to the DFO or the CFIA. As a former public health nurse, I would have understood the importance of having the aborted seal placenta tested, if only I had known the seal herd was carrying brucellosis. The truth is that this was only one of many dead seals I’d come across that summer, because grey seals and harbour seals in my area are killed in an indiscriminate “nuisance seal” hunt by the local fishermen, who then routinely leave the carcasses to litter and foul the shoreline as they decompose. Therefore, my assumption about the aborted grey seal fetus was that the mother seal had likely lost her baby because she’d sustained a gunshot injury. But I now realize that this little dead seal may have held important information about an adverse impact on the grey seal herd itself, from brucellosis. Since the seal brucellosis was discovered, six years ago, DFO has apparently done nothing about the problem beyond issuing a brief annual media release informing the public that contact with seals might be “risky” because “seals bite.” Knowing that the seals have brucellosis, and that this poses a potential threat to human health, DFO has failed even to insist that fishermen retrieve the carcasses of the “nuisance seals” that they shoot. This year, fishermen in Nova Scotia reportedly commercially slaughtered about 800 grey seals on beaches, and the fishermen left the seal offal where the seals were killed, on the shorelines. Residents, visitors, children and pets, all flock to the attractive Nova Scotia shoreline, and all of them may risk becoming ill with brucellosis if they come into contact with any seal, dead or alive. In recent years, I have asked DFO repeatedly for an open discussion about what its scientists know about the failing health of the ocean ecosystem. But they have refused to engage in any dialogue me on this subject, trusting, it seems, that nothing will come of my questioning because I am not a credentialed scientist and because the public does not understand what I have been trying to talk about (why the fish are starving, etc.). However, it was a shock for me to discover that DFO’s reluctance to impede the goals of the fishing industry might extend as far as turning a blind eye to a serious public health concern. As mentioned earlier, most people in this day and age will not knowingly buy even boot leather that was made from an animal infected with brucellosis or any other notifiable disease. And for this reason a prestigious international health body was established in 1924 (the OIE http://www.oie.int/eng/en_index.htm ) to protect the public from exposure to such threats through international trade. Trichinosis is another OIE-notifiable disease when it occurs in livestock. Trichinosis has also been found in marine mammals, including seals, in Canada, but this fact appears not to have been reported to the OIE despite Canada’s involvement in the international export of seal products. Canada last notified the OIE of trichinosis when two cases were found in swine in 1996. Since then, it appears, Canada has enjoyed a “trichinosis-free” reputation. Mammals with the potential to spread trichinosis, and that are subject to the “healthy at the time of slaughter” requirement, are nevertheless routinely screened for trichinosis in Canada. This is done for pigs. The testing for trichinosis includes microscopic examination of the muscle tissue for larval cysts, which can hatch into Trichinella worms. But this testing is not required for any “seafood,” including seals. The manner in which seal hunting in Canada is currently conducted results in massive amounts of seal carrion being deposited in the ocean, an activity that might facilitate the transmission of trichinosis in marine mammals, considering the hypothetical involvement of a nibbling fish vector. Most people know that pork should be well cooked to avoid contracting trichinosis. However, the blind entry of worm-laden pork or seal meat into the marketplace accompanied by a consumer warning to cook it well – this is not the goal of modern meat hygiene. The goal is to block meat containing Trichinella worms from entry into the marketplace, whether that meat is raw or cooked. Therefore, it does not matter how long Canada plans to cook “seal salami,” this proposed export product may remain unfit for human consumption by international standards unless the product has been proven to be free of Trichinella. Animals with trichinosis are deemed unfit in this day and age for commercial use as leather, fur, oil, meat or trinkets. Seal oil capsules made in Canada may potentially contain botulism toxin (in addition to Brucella) because the oil appears not to be pasteurized. A very common bacteria, known as Clostridium botulinum, releases a deadly toxin into foods that are stored improperly in airtight conditions. Many foods can support the growth of this bacteria, and these foods can thereby potentially cause botulism food poisoning. “Low acid” foods (like meat) in cans or other air-tight packages offer the greatest risk of botulism poisoning. But Clostridium can be eliminated if the food is subjected to enough heat, and this principle forms the basis, for instance, of the guidelines for home canning. Pressurized devices are used to raise the temperature of sealed food past the normal boiling point of water, and these conditions must be maintained for a set time to kill Clostridium and its spores. The heat treatment principle also forms the basis of guidelines for the “commercial sterilization” of food. Seal oil capsules made in Newfoundland are reportedly manufactured “by a process of cold pressing, centrifuging and mechanical filtering.” But wait – that can’t possibly be right - cold pressing?? Can consumers trust that merely “filtering” seal oil will remove spores of Clostridium? (and the Brucella?) Seems unlikely…and besides, this does not describe an acceptable process to achieve commercial sterilization of food. Oil naturally creates an airtight environment, and this airtight environment will be well maintained, one must assume, inside a gelatin capsule. Pure food oils, such as olive oil, containing no particles of water-containing food (i.e. meat or vegetable), will not normally support the production of botulism toxin, and they are safe to eat. However, a small amount of other food contaminating stored oil can lead to botulism poisoning. Cases of botulism were reported recently when herbs were added to bottled olive oil and the product was not consumed promptly. It seems that the seal oil manufacturing process might aim to remove all of the dangerous bits of seal flesh, blood, hair, bacteria and parasites from the oil by “centrifuging and filtering” and that this is how botulism is meant to be prevented. Can that process possibly be good enough? I don’t know, but the plant that produces the seal oil capsules, Atlantic Marine Products, reportedly works under CFIA approval, although this claim made on their marketing websites does not indicate whether the plant is approved by CFIA as a "meat" processing plant or as a "fish" processing plant. Seal oil is being hyped as a healthy source of essential fatty acids, especially omega-3. In an argument against “fish oil” as a good alternate source of omega-3, seal-oil promoter Cosmas Ho wrote in his book, “Omega 3 The Seal Connection,” that part of the inferiority of fish oil is related to its production method, which includes “cooking.” Is he worried that applying heat to seal oil might damage it? The risk from consuming un-pasteurized seal oil may be higher than the risk from un-pasteurized emu oil because emus, being birds, have no potential to transmit mammalian diseases like brucellosis or trichinosis to humans. But seals certainly do, and at the barest minimum, effective pasteurization of seal food (and seal oil qualifies as “food”) should be imperative before this product is sold. The final consideration on the risk of botulism is to acknowledge that seal oil has recently caused deaths by botulism poisoning among the Inuit people of Alaska. Just try "googling" on "seal oil botulism Alaska" and see what comes up: far too many outbreaks of this very serious illness. Let's talk about who knows what else? “Seal oil, once extracted, is marketed in capsule form, which is rich in Omega-3 acids. The fatty acids are known to be helpful in preventing and treating hypertension, diabetes, arthritis and many other health problems. Does DFO honestly expect these particular "facts" to have a five year shelf life? Well what about animal consumption, is seal at least fit for animal consumption?…NO, ABSOLUTELY NOT! First, it is just not a good idea to feed carnivores to carnivores, and “seal” is therefore an unwelcome ingredient in dog and cat food. But secondly, using seal meat for animal feed has been tried in Canada and it has turned out rather badly. “Foot pad necrosis was identified as a “new” emerging disease in Canadian mink in 1996. The disease presents as a vesicular disease with small, fluid-filled vesicles (blisters) forming along the margins of the foot pads and the adjacent haired skin, in the interdigital skin webs and around nail beds. Sometimes lesions are present along the margins of the eyes or nose. If bacteria infect the open vesicular lesion, severe secondary bacterial infections develop that cause pain, lameness and sometimes death. Males affected during breeding often had very sore feet and failed to breed. There is a strong epidemiological link between the emergence of the disease and the feeding of east coast seal meat (mainly Harp seal). The initial research done on this condition described the pathology and epidemiology of the disease but it was not successful in determining the etiologic (causative) agent(s). A marine calicivirus (San Miguel sea lion virus) is the prime candidate, but all attempts to isolate the virus failed, although serologic evidence was found to demonstrate that the virus was circulating in east coast Harp seals. Is it possible that DFO’s seal meat promoters are unaware of this? “Males affected during breeding often had very sore feet and failed to breed? !” Good grief, did not even this item of information set off a warning bell at DFO and CFIA? …What about “naïve” sealers? ...What if the new “circulating” harp seal virus ends up causing the same symptoms in human males who eat seal meat or take seal oil capsules? ...What if sealers get sore feet and cannot breed? Does seal blubber contain enough chemical pollution today to reject seal oil for human consumption on that basis alone? And is Atlantic Marine Products, the maker of Terra Nova seal oil, a bit worried about customers thinking this? Regarding pollutants, scientists continue to report observations of an increasing trend of accumulating heavy metals, PCB’s, etc. in marine mammals. The pollutants are most concentrated in the blubber, and in apex predators such as seals. The pollutants are thought to adversely affect the immune systems of these animals, and this may be one factor that has contributed to the rise of infectious diseases in seals. Newly weaned seal pups carry much higher concentrations of persistent pollutants than do their mothers. This is because, while nursing, a substantial fraction of the mother’s body fat is in effect transferred directly from the mother to the pup through the milk. Then an effect called bio-magnification occurs, as pollutants become more concentrated each time they shift into the next consuming animal. In Pacific killer whales a trend was recently observed of an uncommonly high death rate among the firstborn young. Scientists concluded that the baby killer whales were dying because the firstborn baby whale or seal pup gets hit with the fat-stored toxins that have been accumulating during the entire earlier life of the mother. In seals this would be about five years worth of toxins to be downloaded on the first pup, but then a lesser quantity, depending on the length of the birthing interval, perhaps one or two years worth of toxin accumulation for each subsequently born pup. It is unknown whether firstborn seals are now toxic enough to die early from this cause alone, but this certainly seems to be within the realm of current or near future possibility. Oddly, Cosmas Ho describes living seals instead as working to “bio-filter” “natural impurities” out of fish oil as part of his claim that seal oil provides the ultimate in healthy omega-3 oil for human consumption. On its promotional websites, Atlantic Marine Products does not report the use of any process to remove fat-stored chemical pollutants from seal oil. Since the early 1970's, animal welfare groups have protested that Canada's slaughter of seal pups is unacceptably cruel, inhumane. Public disapproval of "cute" whitecoat harp seals being clubbed and skinned alive led to a ban on the slaughter (or "harvest," if you prefer to use "fishing" lingo) of whitecoat seal pups in 1987. Now harp seal pups are killed at an age a couple of weeks older than the pup shown above, after the white fur has been shed and the underlying silver-grey coat appears. DFO today protests that animal rights groups are dishonestly using images of newborn harp seal pups in their publicity materials against the harp seal hunt. So, the animal welfare groups have mostly removed whitecoat pup images from their seal hunt protest websites, showing instead the grey coat "beater" pups, the age of most seals slaughtered today. Might DFO actually be trying to suppress the (somehow offensive?) image of the whitecoat harp seal pup? To erase this vision from the public memory? And, can a solid argument really be dismissed because it is illustrated with such an appealing photo...? DFO calls it a "myth" that seal pups are still skinned alive in Canada. However, under the "tightly regulated" seal slaughter, it is not illegal for sealers to skin a seal that is still breathing, that has a pulse, blood pressure, and even a writhing torso. Whether a writhing seal is exhibiting a "swimming reflex" or a conscious struggle, it is not a "dead" animal, but a "live" one. The Canadian rules have never required that seals be "dead" before being skinned, only that sealers try to render them "irreversibly unconscious." There is a difference. A "dead" mammal has no heartbeat, no pulse, and it is not breathing, or writhing, nor is it displaying reflexes, either blinking or swimming. The "Independent Veterinarians Working Group" (IVWG) seemed to be suggesting at DFO's seal forum in 2005 that Canadian rule-makers should now consider moving toward a requirement that seals actually be killed before being skinned. The IVWG recommended "bleeding" seals after "stunning" them and before skinning them. If arteries are cut and enough time is allowed for proper "bleed-out" to occur, then the seals will be dead, with no heartbeat, not breathing, not moving, and they will also of course be finally and "irreversibly unconscious." Prescribed "bleed-out" procedures and times are followed in abattoirs before the carcasses of food animals are cut into. This is what is normally considered to be "humane slaughter" in slaughterhouses - dead before being cut up. However, seals slaughtered in Canada have never been given the same consideration as other mammals. Instead, seals have long been, and continue to be, skinned alive. Animal welfare groups who have protested on this point have always been right. 3. What should be done about the poor health of Canada’s seals? a). Canada should report brucellosis and trichinosis in seals in Canada to the OIE, and appropriate domestic seal product recalls should be made, under the direction of the CFIA. The necessary modifications to current seal processing methods that will be required to allow seal products to be deemed safe for human consumption as "meat products" promise to be so onerous that all profitability from commercial sealing stands to be lost. There is likely no point in even trying to implement proper slaughterhouse rules for the inspection of potential seal products (such as veterinarians testing seal blood for Brucella antibodies, examining carcasses and culturing lymph nodes, etc.) because the Canadian harp seal herd is already known to harbour brucellosis. Canada should apologize for its rudeness to people who have offered over the years and who have tried to act as volunteer "humane slaughter" inspectors at the harp seal hunt (the "anti-seal hunt protestors" who have watched as "observers"). Whether the slaughter of food animals is conducted humanely is only one checkpoint in the normal veterinary screening procedure for wholesome animal food production. Canada has avoided implementing any formal veterinary oversight of seal processing, and has thereby left the consuming public potentially exposed to known risks. Systematic ante-mortem and post-mortem health inspections of all animals must ordinarily pass the approval of qualified veterinarians before mammals can be processed into human food. Throwing seal entrails onto volunteer amateur humane slaughter inspectors is not a reasonable substitute for this step in the food safety process. A special apology is owed by Canada to Rebecca Aldworth, and unfortunately, the volunteers who were hit with seal guts should probably be checked for brucellosis. b) A disease “eradication” program, such as is carried out to deal with reportable diseases in farmyard livestock, cannot be contemplated for seals. Instead, people should simply be warned to stay away from marine animals, and not to “use” them at all. Seals continue to play a very important role in what is now a stressed and unstable ocean ecosystem. In a brief flash of understanding, DFO included the correct seal management guidelines in their recent “seals bite” press release, when someone in the Communications Branch wrote “seals are wild animals and should be left alone.” Fine. End of discussion. c) Canadian Public Health authorities should be notified of the human health threat posed by seals. Medical doctors should be advised that they might encounter cases of now rare human brucellosis and trichinosis in Canada below the arctic, because these diseases exist in our marine mammals. No need for hysterics, though, the seal warning will be something like keeping in mind that bats might carry rabies - so just don't touch them. Seals will be more easily avoided than bats because these fish can't fly. A special alert should be issued regarding brucellosis in grey seals in Nova Scotia. d) Ethical and accountability issues should be addressed. There should be an open investigation into why the CFIA has added "seal meat" to “fish and seafood” health certificates for products exported from Canada. This demonstration of a lack of integrity on the part of Canadian “seafood” processors and government officials may serve to tarnish the reputation of all Canadian seafood exports. Another question arises regarding information on CFIA's website: where is the missing veterinary health certificate that should be accompanying seal pelts exported from Canada to Russia? Examples of many other such export certificates are available on CFIA website, linked from http://www.inspection.gc.ca/english/anima/heasan/export/prod/prode.shtml -- and the only link on that page that produces a "sorry, unavailable" message is the link to the "veterinary health certificate" for “furs dried not treated” to be sent to Russia. We also need to know why Canadian government money continues to be thrown at a useless pipedream in the modern world, a "sustainable seal fishery." "The Canadian harp seal hunt has the potential to be a humane hunt -- one that should be judged with reference to accepted practices for euthanasia, and in comparison with killing done in abattoirs." "The methodology proposed by the Group is consistent with the AVMA panel on euthanasia report, and accepted abattoir practice....Veterinarians can only advise." "All members of the Working Group feel that sealers should make every effort to ensure that a seal is bled before hooking or skinning." "On May 27-28 the IVWG met in camera to discuss the hunt..."
'It is carried out by a large number of hunters, over an extensive area, in a short period of time, and monitored by a relatively small number of regulators." "This report discusses a range of factors and issues related to the hunt, and makes eleven recommendations to the sealers, industry and regulators." "Individuals should receive training before they are licensed as hunters, and periodic upgrading should be required." "Industry should continue to strive for full utilization of each seal killed." "Development of markets for seal meat should be encouraged, however it should be noted that development of consumer markets for seal meat will necessitate improved carcass handling and storage processes. Such use of seal parts for specific markets is a component of full utilization." "In order for anyone to attest to the humaneness of the hunt, there must be an improved level of supervision and monitoring." "Sealers would benefit from strong professional associations that support and promote humane practices." Truth is stranger than fiction. On the CFIA website is the "List of Canadian Acceptable Common Names for Fish and Seafood." The list is extensive, but "seal," "harp," "meat," "Pagophilus groenlandicus" and "Halichoerus grypus" are nowhere to be found. Several acceptable seafood names sound initially as if they might be disguises for products obtained from mammals, but in each case the name turns out to refer to an organism that is in fact cold-blooded, i.e. fish, molluscs or crustaceans. Checking reveals that the acceptable common seafood names catfish, sheepshead, blue dog, hairtail, rattail, elephantfish, rabbitfish, buffalofish, lionfish, horse mackerel, witch, hairy cockle, wolffish, milkfish, butterfish and even "flathead captainfish" are not used to describe products that were actually derived from mammals. Similarly, "flying fish" and "canary rockfish" are not derived from birds, or from rocks. "Dolphinfish" and "beluga" sound like mammal products for sure, but no, they are both actually fish too...so all of these seafood products would seem to be on the up and up. "Tusk," even, does not refer to part of a walrus, but to a finfish. Besides "seal," "walrus" and "whale" are found nowhere in the List of Canadian Acceptable Common Names for Fish and Seafood. Obviously, these marine mammals are meat too, and although seals, walrus and whales have long been consumed by indigenous northern communities without the benefit of modern precautionary meat processing techniques, this approach is not an acceptable one for sending animal products to today's commercial consumer market. (P.S. I filed formal consumer complaints with DFO and CFIA asking that they investigate potential human health risks that may be associated with the consumption of commercial seal products, as described above. No answers have been forthcoming yet, but I will add the DFO and CFIA replies to my complaint to this webpage once they have been received. UPDATE: May 20, 2006 - no answer from any of the responsible government agencies a month after filing my complaint, so I've written to Chuck Strahl, federal minister responsible for the CFIA, and to the ministers of Health and Fisheries and Oceans (link to letter)) SEAL DISEASE UPDATE OCTOBER 23, 2006 - Responses from government.